The design concept consists of ten stainless steel chairs referred to as the 'Storytelling Chairs' which tell the story of the former Immigration Hall building and provide a place for new stories to be told. The chairs are sited within a cobblestone border that demarcates the footprint of the original Immigration Hall building. 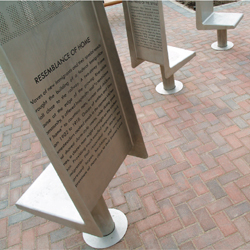 The design has included images and stories that are etched and perforated into each chair back. 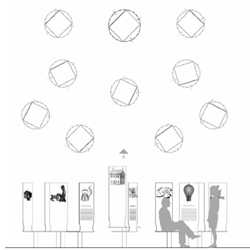 As well, a swivel mechanism allows each user to reposition the chairs for socializing and events.